Earlier this week I was looking at pictures of Can-Am cars and this scale model caught my eye. I had never seen this livery before. Me being a fan of Can-Am/Interserie racing I thought I knew every Gulf liveried Can-Am car in existence. Turns out that I was right as this one as far as I can tell never actually existed. 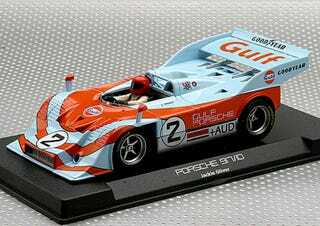 This Porsche 917/10K was supposed to be the main Porsche backed team J.W. Automotive's car for 1972 Can-Am season and the team's first entry to North American racing scene. Jo Siffert was supposed to come to drive for J.W. Automotive from Porsche-Audi team but things didn't go as planned and he died in a race at Brands Hatch in 1971. After Siffert's death Jackie Oliver was hired to drive the car against the will of J.W. Automotive's John Wyer who went on to pull the plug from the project. After this Porsche reached out to Roger Penske and his team became the main Porsche backed team in North America.